Countries and nations are well known for their cultural heritage and values. There are several countries all around the globe which are culturally very rich and attract millions of sights. Chicago is also one of them, known for its Chicago Cultural Center. The Center has spectacular landmark buildings, structures, outstanding stained-glass auditoriums, theatre, dances, free music, lectures, films, family events and art exhibitions. The Center was elegantly designed to make an impression and to demonstrate that Chicago had developed into a beautiful, attractive and sophisticated metropolis. The top craftsmen of country and architects used the most extravagant and luxurious materials, like imported rare marbles, fine hardwoods, polished brass, favrile glass mosaics, colored stones and mother of pearls to create an awesome architectural showplace. It is located in the south side of the building. While it isn’t exactly a great example of living green, the beauty of the craft work is well worth seeing. The largest stained glass of the world, Tiffany dome (which has a diameter of thirty eight feet, with about thirty thousand pieces of glass) was restored to provide its innovative magnificence in 2008. On the very north side of the building, there is a dome of forty feet diameter with some fifty thousand glass pieces in a complicated Renaissance model. It was designed by Millet and Healy. 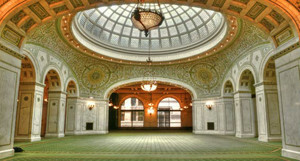 In year 1991, this building was created as Chicago Cultural Center by the Division of Cultural Affairs of Chicago. It is the first and most inclusive free cultural municipal venue of nation. Every year, Chicago Cultural Center presents thousands of free national, international, local and regional artists, performers and musicians, presenting a showcase where the people can enjoy, watch and learn several facts about arts. Other things rather than art and architecture that attracts millions of people to visit here are building tours that provide a look to the entire attractive sections and points in the building having cultural importance. Shopping is another favorite section available here for visitors. Randolph café is a very prominent cafeteria of the place where people get fresh food at affordable rates.